What You Get: A well-equipped Standardbred operation on 64 acres. The House: The 2,800 sq. 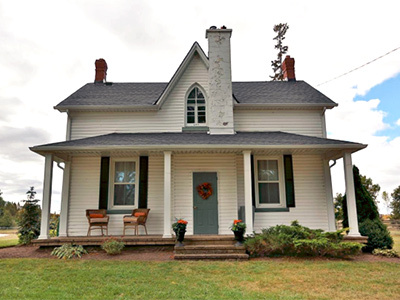 ft. century farmhouse is well cared for, with 4 bedrooms and 2 bathrooms. It has a lovely covered front porch perfect for relaxing and taking in the pastoral views. The Barn: The original bank barn has 13 stalls, a wash area, heated kitchen and a bathroom. The newer barn has 34 stalls, 2 wash stalls, a heated office and a bathroom. There is also a ½ mile training track with a pond in the middle, and 2 covered walkers. The property is minutes away from Mohawk Racetrack.